Located in Bois-Le-Roi, this guesthouse is situated 35 minutes from Paris by train and a 5-minute train ride to the Château de Fontainebleau. It offers rooms with views of the guesthouse?s gardens. The soundproofed guestrooms at Maison d'Hôtes Villa Brindille are simply furnished and feature king-size double beds. Each room has a shower and free toiletries. A continental breakfast is served each morning at Villa Brindille and guests can enjoy breakfast on the patio when the weather is nice. The property also has its own wine cellar, where you can buy local wines and spices. Guests are invited to visit the bookshop located in the same building as the guesthouse. Additional facilities available include bicycle hire and free on-site parking. 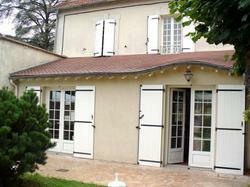 Bois-Le-Roi Train Station is located 100 metres from the guesthouse. Bois-Le-Roi is 3 km from Samois-sur-Seine and 8 km from the town of Barbizon, a favourite with the Impressionist painters. Daily housekeeping is available upon request. This double room features a soundproofing and patio. It also includes a dining area. A baby cot can be accommodated in the room. This spacious suite has 2 rooms and offers a dining area with an electric kettle. This room is suitable for a maximum of 4 adults and 1 child. This room features a dining area with an electric kettle. It also includes a dining area. A baby cot can be accommodated in the room.